Thousands of Texans drive to Colorado for ski vacations. The combined population of the cities marked on the maps below is about 16 million people. 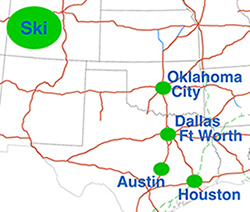 There is currently no clear direct highway access from the Dallas area to the ski slopes of Colorado. 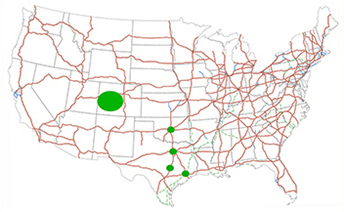 To stay on a controlled-access interstate or toll road, one must go from Dallas due north to I-70 in Kansas or go due west to I-25 (or a cutoff). 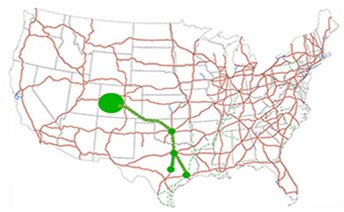 A new toll road slicing at an angle from Oklahoma City directly to Pueblo Colorado would shorten the drive, take less time, and earn money for the OK Turnpike Authority. 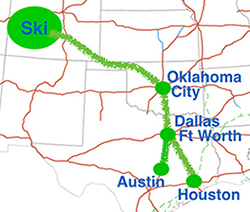 To introduce and facilitate direction, the new road and existing highways in Texas and Oklahoma could be branded as the Okie Ski Trail. A mark to place on highway signs could be a green disk with a skier android figure inside. The green disk is familiar to skiers as denoting the easiest way down the mountain, just as the new highway provides the easiest way to the mountains. Date of conception: 1995, while planning a road trip from OKC to Colorado.